Century Egg composes Chinese pop songs by Email. And a war is brewing in the Canadian art world. It's a war of loverz, haterz and haterzhaterz. 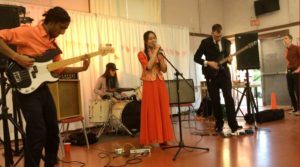 Century Egg makes Chinese pop music in Halifax. They just wrapped up a mini-tour of central and eastern Canada. They have a peculiar approach to writing music: River God, the title track off their latest release, was written in 20 minutes, while singer Shane Keyu Song and guitarist Robert Drisdelle waited for their rice to finish cooking. A string of anonymous meme accounts have started a war in the polite Canadian art scene. @CanadianArtWorldHaterz’s memes call out fellow artists and gallery owners across the country, tackling issues of representation and power imbalances in the art world. And they’re naming names. @CanadianArtWorldHaterz quickly spawned reaction accounts, including @CanadianArtWorldHaterzHaterz and @CanadianArtWorldLoverz. Sholem Krishtalka of Toronto’s infamous critical art zine, Art Fag, reflects on the importance of criticism, and why Canada’s so averse to it. Find his non-Art Fag work on his website. “Never Trust a Storyteller” and “Inter-Mission” by Obuxum. Find more of her music here.